History was made this past Tuesday night. I let my children stay up and watch it unfold on the news. Once again I was able to stress to them that they are experiencing historical event, live and in living color that school children will one day honor and cherish in a History school lesson. I thought these three sisters I met in NJ were a great example of embracing change in America and to always have HOPE in your heart. Here's a link to a news article about the event my sister is participating in Tunisia, Africa. Watch for coverage of this event on CNN through out the weekend. 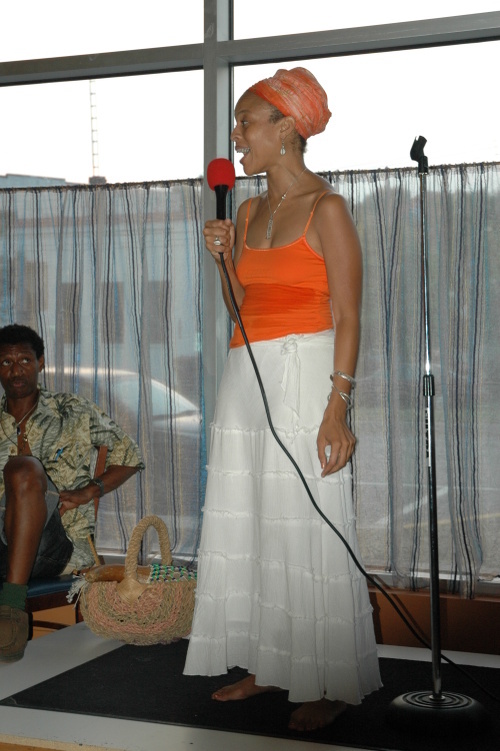 Here she is making an announcement at her going away fundraiser before she and two others went to Ghana for a five month immersion and travel to eight African Countries. For information on the video she produced in 2007 visit HERE and make a donation. I've had a number of conversations with my kids this month regarding Black History Month. I'm trying to convey to them that it's not just only about celebrating the "heroes" of our past, but those that are still making history today. They asked my Dad if he met Dr. Martin Luther King, Jr. and I commented that by them meeting Dominique Dawes, they've met someone who was a "First/Hero" in their field. To really bring it home, I told them about how there Dad was the first black volunteer fire fighter at the Takoma Park station, how there mom was the first black featured baton twirler in her high school...how my book is the first multi-cultural inspired scrapbooking idea book and how Leah's Gymnastic team is making "first history" in our county and state in the competitive gymnastic world. My daughter Leah is mentioned in an article about the success of her Gymnastics team. Being a predominantly black team in competitive gymnastics...now that's being a part of Black History. CLICK over to my book website and take a peek about my interview with a local newsreporter. My heart aches every time I see a newscast. No matter how many memories I try to preserve on paper, nothing matters more than preserving memories of God's Word in our hearts. I know people are without the basics, but I hope they can soon recall that our God is a faithful God. The most frightening thought is how uncoordinated our government appears to be in the face of a disaster. My husband the firefighter is even more determined that we need our own personal disaster plan, in case of terror strike or another lashing of nature.